A recitation programme was organized by Tarunner Ucchash with the support of Assistant High Commission of India, Chittagong on 9th December, 2016 at Zilla Shilpokala Academy, Feni. 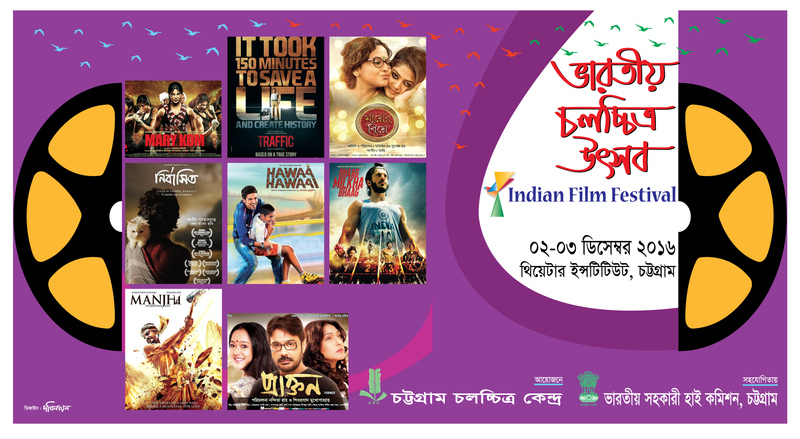 Indian Film Festival was organized by Chittagong Film Centre with the support of Assistant High Commission of India, Chittagong from 2 - 3 December, 2016 at Chittagong Theater Institute. 8 Indian feature films were screened. Roohani sisters, Sufi singer performed on 2nd December 2016 at Shilpakala Academy Open Theater, Chittagong. Dr. Swapan Mukhopadhyay, noted folk singer from Bengal performed on 1st December 2016 at Shilpakala Academy Open Theater, Chittagong. Ms. Marina Ahmad, Indian Classical Singer performed at Fulki Auditorium, Chittagong on 4th November, 2016. Assistant High Commission of India, Chittagong observed the birth anniversary of Sardar Vallabhbhai Patel on 28th October, 2016 at the Chancery premises. Assistant High Commission of India, Chittagong sponsored a programme of recitation by renowned artists of India and Bangladesh organized by PROMA Abriti Sangathan on 29th May, 2016 at Theater Institute Chittagong. Abhyudoy Sangeet Angan celebrated Tagore's birth anniversary on 20th April, 2016 at Theater Institute Chittagong with support of Assistant High Commission of India. Distribution of scholarship cheques to the descendants of Mukti Yoddhas on 23rd April, 2016 at Theater Institute Chittagong. A painting and sculpture exhibition of young promising artists of India and Bangladesh was held at Shilpakala Academy in Chittagong during 28 - 31 December 2015.